Once again, hither comes Conan. Perhaps you only know the character from Arnie’s portrayal in the cult classic Conan the Barbarian film (arguably the most quoted movie in all of fandom, outside Star Wars of course). Or maybe you’re familiar with the pulp stories penned by the famed eccentric Robert E. Howard that very well defined the Sword and Sorcery genre of Fantasy Fiction. 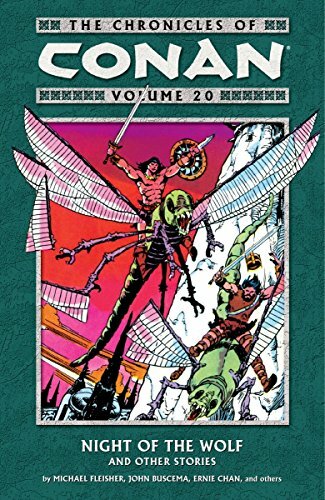 But Conan has also been a long staple of comics as well, and Dark Horse has now collected their 20th volume of classic Conan stories. These stories embody the grimness and savagery of the mirthless Conan, and the brutal struggle against both men and magic that so well defines Howard’s hero of the Hyborean Age (one of Earth’s many forgotten pre-histories, like Tolkien’s Middle Earth). All the pulpy camp is here as well, from the seductive temptresses and distressed maidens in need of rescue, to the ostentatious wizards and hell-spawned monsters, but if you can take it all in good fun, the stories can be very entertaining. I like my fantasy with a little more grit, and at times I found the narration seemed more fitting to a romance novel (describing Conan’s “sun-bronzed skin” and “tawny thews”) than channeling the Spartan language of Howard, but again this is fantasy for people who don’t really want to take their fantasy too seriously, and there’s really nothing wrong with that. From battling gargoyle-like people from the back of a giant dragonfly to relieving cowardly kings and black-hearted sorcerers of their treasure, Conan is as much the badass as ever. If you’re looking for a fun romp through a fantasy setting that’s not full of unicorns and fairies, then this book may just be for you.